Our current system of industrialized agriculture is dependent on the input of a vast array of toxic chemicals, from production through packaging and distribution, creating hazards to both human and ecological health. Agricultural pesticides, plastics with chemicals such as Bisphenol-A,and Persistent Bioaccumulative Toxicants or PBTs such as Methylmercury are just a few of the many chemicals of concern. An estimated 700 million pounds of pesticides are used in agriculture each year in the United States, which is harming our health and undermining the resilience of the ecosystems that support us. The increased reliance on genetically modified crops has increased pesticide usage significantly. The healthcare sector treats the downstream health burden of agricultural pesticide use. A growing body of evidence links certain classes of pesticides to cancers, neurodevelopmental disorders, reproductive disorders, asthma, birth defects, acute poisonings, and Parkinson’s Disease. Emerging evidence on endocrine disruption points to the power of some pesticides to impair our hormonal systems which govern our body’s metabolism and development. 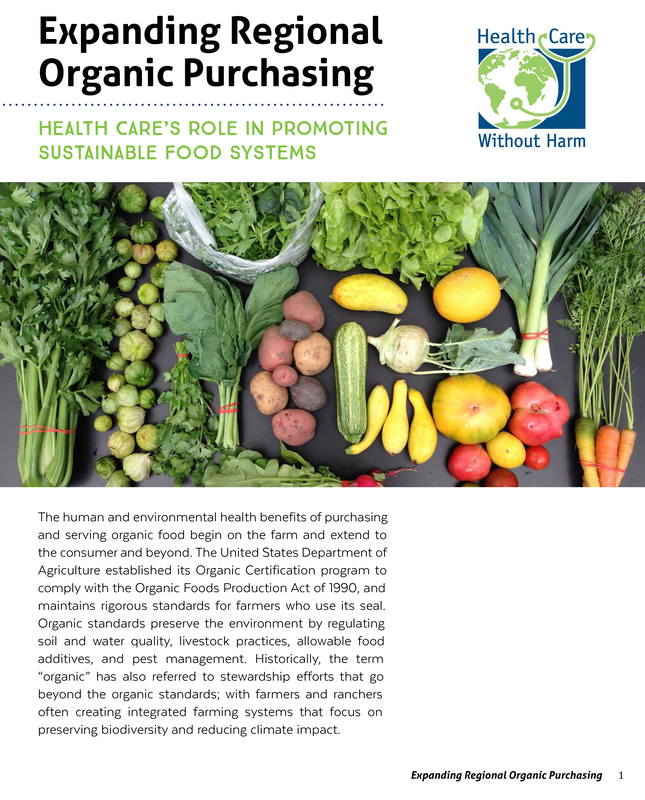 The Healthy Food in Health Care program educates healthcare professionals on the health impacts of toxic chemicals in our food systems and leverages the purchasing power of hospitals to support farmers who use none or fewer synthetic pesticides; and to make purchasing choices that reduce use and exposure to other toxic chemicals in the food systems. We work in collaboration with strategic national partners on education and engagement of the healthcare sector, including: Health Care Without Harm's Safer Chemicals Program, UCSF Medical Center Program on Reproductive Health and the Environment, and Pesticide Action Network. Reproductive Health and the Industrialized Food System: A Point of Intervention for Health Policy, an article written by Health Care Without Harm's team of experts which was published in Health Affairs.